Actor Saif Ali Khan, who had previously said working with alleged harassers amidst India's ongoing #MeToo movement is off-limits for him, addressed the issue of sexual harassment yet again and told news agency IANS that his family is safe guarded from unwelcome advances. Speaking at an event in New Delhi, Saif Ali Khan said: "It is a very unequal society. I don't think anyone will misbehave with my people... I don't know why I feel like this, but be it my mother or sister or wife, I feel people will not have the guts to do that with them." 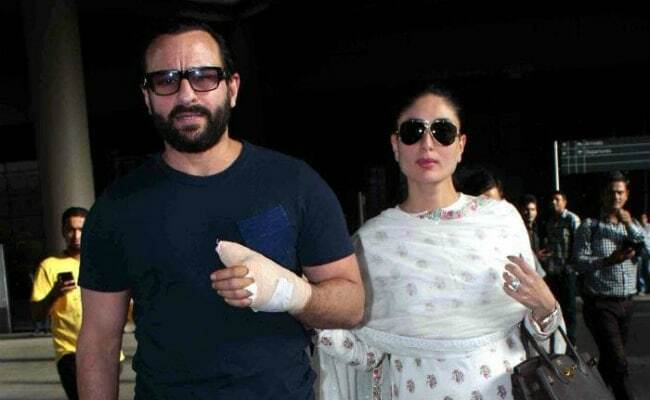 Saif Ali Khan is married to actress Kareena Kapoor and the couple are parents to baby son Taimur. Sara Ali Khan, who is gearing up for her Bollywood debut, and Ibrahim, are Saif's children with his first wife Amrita Singh. Saif, who had condemned the alleged sexual predators in previous interviews, added that not everyone has the privilege to work in a secure environment and hence ensuring work-place safety for women must be a priority: "It might be because they have certain protection around them. So, we have to protect the ladies who don't have that protection around them or that aura that protects them. We have to make the place safe for the vulnerable ladies," IANS quoted him as saying. As the #MeToo movement caught up with the Hindi film industry, several top film bodies resorted to the formulation of sexual harassment committees to address concerns. Saif Ali Khan also hoped that the #MeToo wave leads to the concept of a healthy workplace environment: "We have to come to a situation where women feel safe enough to complain immediately and matters will be taken seriously. I hope the #MeToo movement stays in future and does not die down because it will create a comfortable atmosphere for everyone." Last week, Saif Ali Khan opened up about working with #MeToo accused director Sajid Khan, against who, sexual harassment allegations had piled up earlier this month. Saif worked with Sajid Khan in 2014 film Humshakals and two of his co-stars from the film - Bipasha Basu and Esha Gupta - had also spoken about Sajid Khan's alleged terrible behaviour on sets. "He cracked lewd jokes openly and was pretty rude to all girls," Bipasha had tweeted earlier. Remembering his Humshakals days, Saif had told PTI: "I don't remember anything like this happening genuinely because if it would have happened I would not have been comfortable in that environment or allowed it to happen in front of me." After Sajid Khan was implicated in three prominent #MeToo accounts, Sajid Khan resigned as the director of Housefull 4 - Farhad Samji will helm the film now. Akshay Kumar, the lead star of Housefull 4, had also cancelled film's shoot, following which Nana Patekar also quit the movie. India's #MeToo was set in motion after Tanushree Dutta reopened a sexual harassment case against Nana Patekar last month. Prominent film personalities such as Alok Nath, Subhash Ghai, Vikas Bahl and others have also been implicated in several harrowing #MeToo accounts.